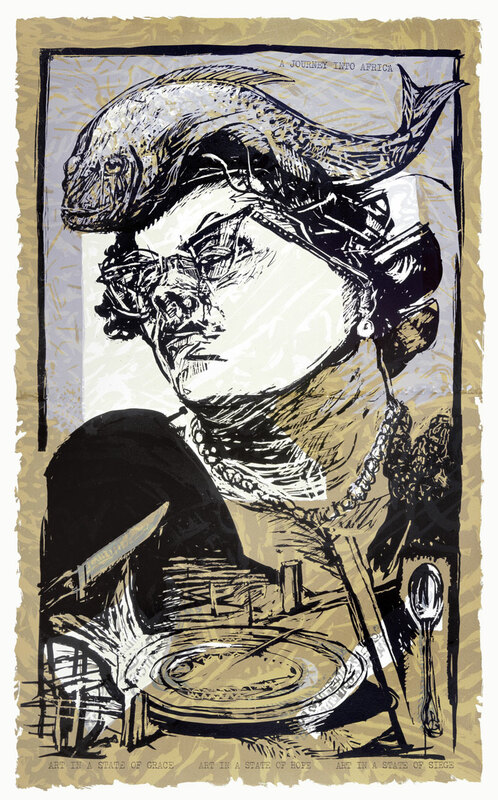 Kentridge is an artist of black and white, a printmaker first, who uses drawing, animation, film, theatre, sculpture, opera, and even tapestry, to make compelling works that interrogate some of the darkest corners of history and the human psyche. 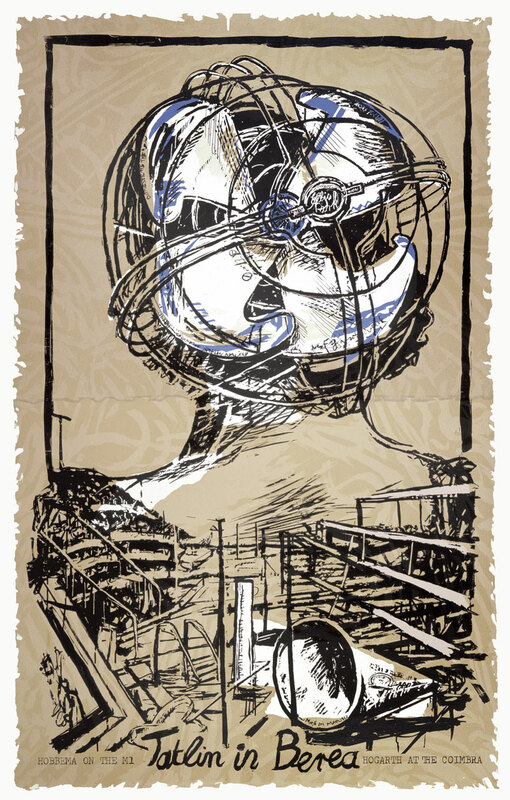 Born in Johannesburg in 1955, the son of prominent anti-apartheid lawyers, Kentridge has, over the last 15 years, become one of the most highly regarded contemporary artists in the world. He has exhibited internationally, and is in as much demand as a director of theatre and opera as a maker of the immersive installations for which he is best known. His many prizes include the Oskar Kokoschka Award, Vienna (2008) and the Kyoto Prize for Art and Philosophy (2010), and this year he was made an Honorary Academician of the Royal Academy of Art. Kentridge read politics and African history – preoccupations that have continued to feed his work ever since – at Witwatersrand University, in Johannesburg. He then went to art school, where, he explains, ‘To be an artist was to paint with oil on canvas.’ Drawing was merely ancillary. ‘Cackhanded,’ as he puts it, ‘with colour,’ and demoralised, he took an evening class in etching. 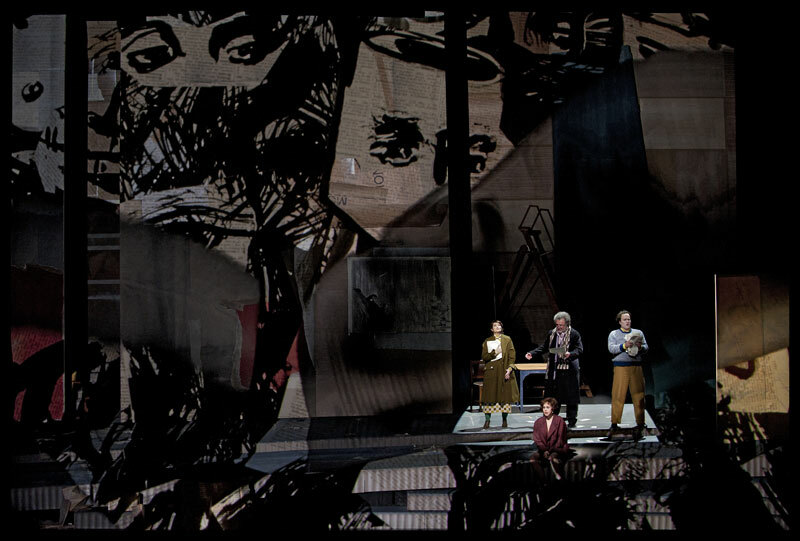 ‘It felt fantastic,’ Kentridge recalls. ‘It let me think, okay, there is a way of being an artist in which colour doesn’t have to be the starting point.’ Through etching he discovered the whole history of printmaking and the first, largely black and white, century of photography. ‘Series of drawings come out of prints and sometimes even theatre projects come out of prints,’ he explains. ‘As does this Lulu production, since what predates it are the linocuts, as a way of thinking before the production began.’ He adds, ‘There is also a way of thinking of an etching as an extraordinarily, ridiculously complicated form of animation, different states of the plate, when you know that you will rework them.’ For Kentridge these mediums are not value free: he reminds me, for instance, that linocut is the tool of the disenfranchised in Africa. 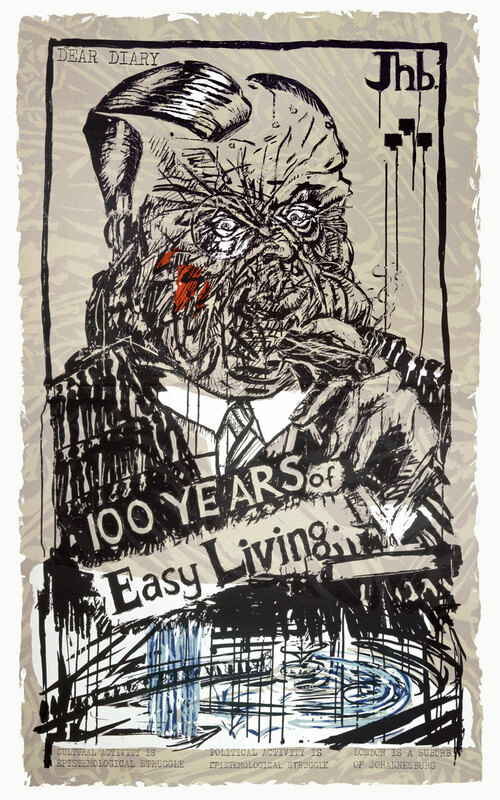 Its lineage goes back to Swedish Lutheran missionaries in Rorke’s Drift, Natal, in the 1960s and 1970s, who taught printmaking under the influence of German expressionism, which in turn drew its inspiration from African masks. One chapter, as Kentridge describes it, in ‘the calamitous history of colonialism’. 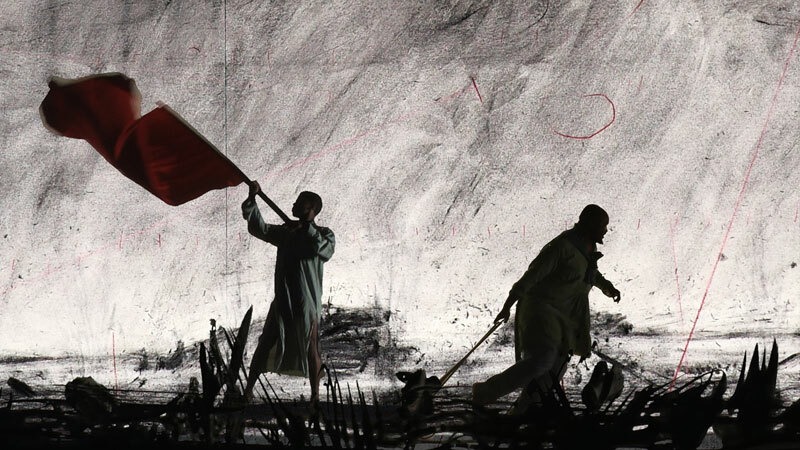 In the nearby EYE Film Institute in Amsterdam, Kentridge has an exhibition running until the end of August. It features another new work, which is also a kind of dance of death. 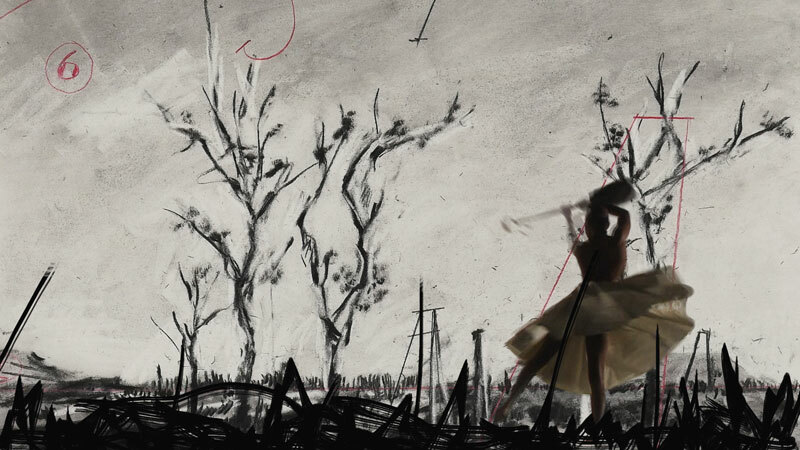 More Sweetly Play the Dance (2015) is an imposing installation of large screens on to which a procession of silhouetted figures is projected; the background is the roughly charcoal-drawn bleak landscape around Johannesburg, with grey clouds sweeping overhead. A combination of drawn, cut-out figures and live actors, this pageant presents us with a band and church choir, prisoners carrying their own cages, figures carrying stencilled cut-outs of heroes or saints’ attributes, but also baths and typewriters, two floats of jiggling cartoon skeletons, floats pulled by labourers carrying local politicians and stenographers, and a troupe of Ebola victims trailing drips. They all process behind a figure who tears the pages from a book and are followed by a sole female dancer with a gun. ‘We are re-staging the procession of Plato’s figures in the cave,’ Kentridge notes in the catalogue. What we see is all humanity trudging behind worn-out creeds, bearing the costs of idealism, but also enduring, singing and dancing. As Kentridge says, ‘There is something utopian always about dance,’ even, terrifyingly, when the dancer carries a gun. While this work can clearly be read as an allegory of South Africa, it also resonates with Imperial parades, Saints’ Days and carnival processions across the world, political rallies and the despairing lines of refugees displaced by war, throughout the centuries. Perhaps one clue to Kentridge’s appeal today is that, as suggested by his triptych of large-scale screen prints entitled Art in a State of Grace, Art in a State of Hope and Art in a State of Siege (1988), he makes work for our besieged times. ‘I never thought of them as setting an agenda for the next 30 years of work. But in some ways they have and they did.’ He continues, ‘Art in the State of Hope referred to the political art of the constructivists, of the early Soviet era, where art and utopian thinking would sit comfortably together. Art in a State of Grace was art retiring from the world into a condition of beauty, if you think of the Matisse cut-outs, and those gorgeous paintings done during the Second World War. That was another kind of thing, which I longed for, but which was impossible.’ Instead, born into the last violent phase of colonial power in South Africa, he has devised an Art of the State of Siege, ‘where all the ambiguities and uncertainties are present, but it is not a retreat from the world nor a triumphalist confidence in the way the world will unfold.’ Certainty, as he sometimes remarks, leads only to the Killing Fields of Pol Pot. Plato’s allegory of the prisoners in the cave is, perhaps unsurprisingly, the text that continues to inspire all of Kentridge’s work. As he said in the first of his 2011–12 Charles Eliot Norton Lectures, Six Drawing Lessons, ‘The questions it provokes, its metaphors, are the pivotal axes of questions both political and aesthetic.’ After all, it is largely in the dark that his works unfold – in theatres and blacked-out galleries – with films and animations flickering urgently on the wall. Plato sees the fools in the cave, watching the shadows cast by people passing above, as deluded and in need of the enlightenment that can only be provided by philosophy. 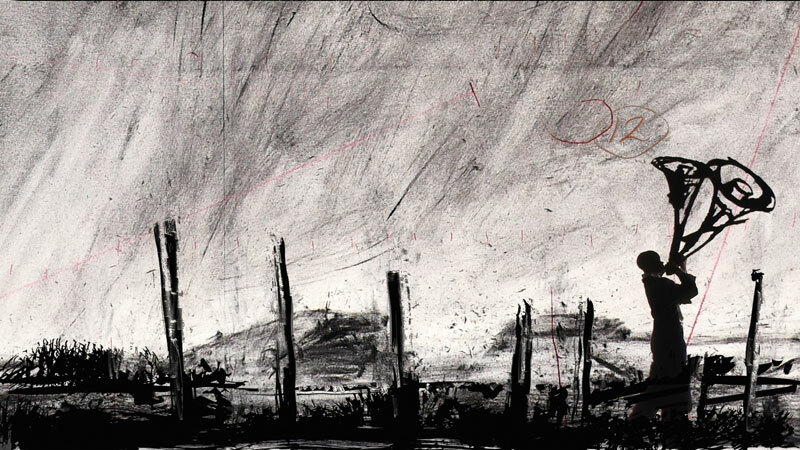 Kentridge, however, trusts his monochrome images, and our imaginative capacity to piece together the truth from them. And once in front of them, it is hard to move away, to go back into the light, so compelling are the truths half-glimpsed in those shadows and communicated with such invention, wit and compassion. 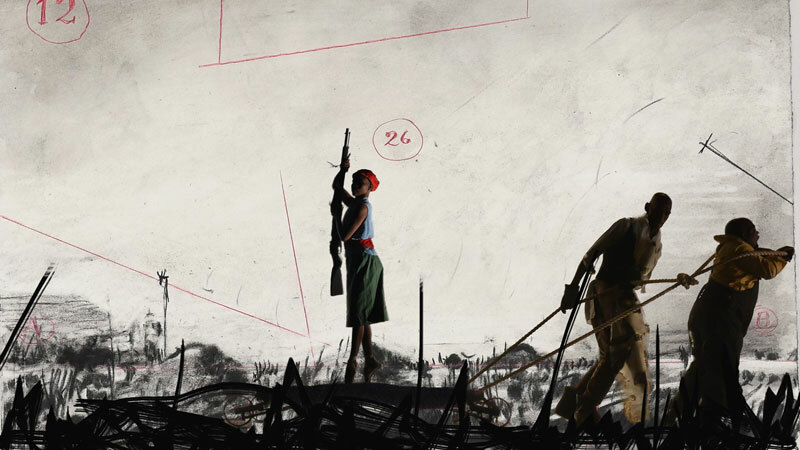 ‘William Kentridge – If We Ever Get to Heaven’, is at the EYE Filmmuseum, Amsterdam until 30 August 2015. Whatever the outcome of the UK’s general election, funding for museums will not increase. How can they adapt?